Kapil Sharma will be back on telly! Kapil Sharma and his team -- minus 'Bua' Upaasna Singh -- will go on air on April 23 with their new show, The Kapil Sharma Show. They recently shot its first promo, and the show will be aired on Sony Entertainment Television every weekend at 9 pm. This means that Kapil will not take on Colors' Comedy Bachao and Comedy Nights head-on. The last episode of Kapil's hit show Comedy Nights with Kapil ended abruptly in Colors in January, without any reference that it would be the concluding show. A member of the new show’s team informs, "We decided the show should be named after Kapil, so it will most probably be The Kapil Sharma Show. 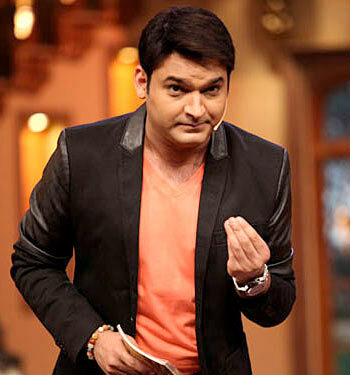 Kapil is the central attraction of the show but we are an integral and essential part of the show." Says a source close to Kapil, "He is hurt by the turn of events, and going to strike back big time with The Kapil Sharma Show." Will Krushna make a better host than Kapil Sharma? VOTE!